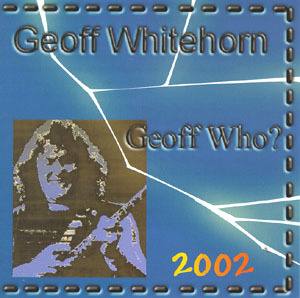 This album is Geoff Whitehorn's reworking of the original Geoff Who? album, with a couple of tasty new tracks. For a report on most of the compositions on this CD, see here. 'Most of the tracks on this CD first made their appearance on the Geoff Who? CD in 1990, with liner notes by Neville Marten, editor of Guitarist magazine. I was pleased with the music, but I always thought that there was something strange about the sound of the CD itself. Which brings us to this, Geoff Who? 2002. In the intervening years technology has raced ahead and we now find better equipment in home studios than was available to a lot of commercial studios ten or twelve years ago. So I thought it might be worthwhile re-recording the tunes from the original CD adding a couple of new ones, and seeing if it made sense to proceed further. 'I think (hope) it has. Most of the guitar parts are relatively unchanged from the original, although my good friend Phil Hilborne has joined me on an extended version of Ninetyonogy. ('Thanks, mate). Other than that, I've re -programmed a lot of the parts and improved a lot of the sounds, taking advantage of whatever new technology has become available. This project was recorded at my "Treehouse Studio" facility, using Akai DR4 & DR16 hard disk recorders, a Mackie 32:8 desk, and guitars from Paul Reed Smith, Tom Anderson, and my great friend, the late Sid Poole. 'Outboard equipment was from Roland, Behringer, Alesis, Presonus, Rocktron and t.c.electronics. All the guitars were recorded using a Marshall JMP-1 valve pre-amplifier. Thanks to everyone who has encouraged me over the years, and to Terry Day, whose original idea it was to do "Geoff Who?" Roland Clare notes: there's little doubt that Geoff has wrought studio magic on these revisited tracks, which all sound more potent and bright than the originals. And there are two new instrumental tracks too: Without Annette is an attractive slow-paced piece with a rather Procoloid section based on appealing chord-changes, with some flowing keyboard figuring in the background; later it builds with some nice twin guitar work, and it's distinguished by some truly fat guitar sounds throughout. Eightyonavee, which concludes the new album, starts with some sci-fi pulsing and chattering Baba O Reilly synths, and sounds for a moment as though it is going to be a cousin of We Don't Talk Any More; but it does develop of characteristically Geoff-like feel and there is a great bass solo line in the middle, with a grand tone like that of John Giblin in the Brand X days! Great stuff, and it ends with a striking burst of guitar, very exciting with artful harmonics ... then it fades, just when it wants to end with a climax! The other changed track is Ninetyonogy, featuring the very exciting guitar of Phil Hilborne ('The Widdlemaster', as Geoff calls him on the credits). BtP spoke to Phil about this extension of the original piece. Phil clarified the mysterious title, as follows ... 'I think it was that 1990 was the year that all UK cars had the letter G in their registration - plus I suppose you could be driving 90mph (speeding) in a car made in 1990 - simple as that!'. BtP notes that the final extra track, Eightyonavee, was presumably entitled ("80 on a 'V'") according to the same curious pattern!